Restaurant Budapest – Simply Yummy! Ok – I know you need more details – but trust me on this – the bottom line is Yummy. The Budapest is a tiny storefront restaurant that we fell into the other night. We were intrigued by the combination of flowers, tablecloths, and smiling hostess/chef. I generally won’t walk into a restaurant that is empty, but we were short of time (on our way to a fringe play), and the prices looked great. 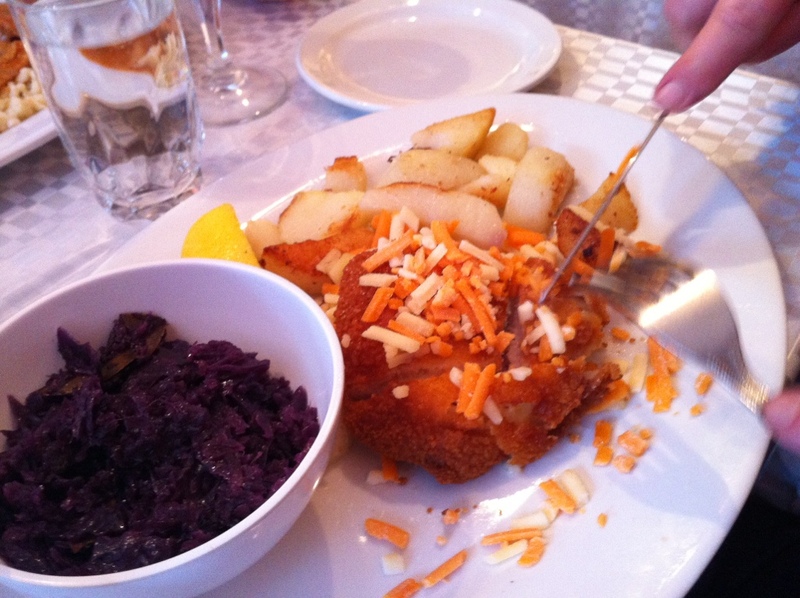 Every entre was under $10 – and the list, while short, sounded delicious – Schnitzle, Goulash, and Chicken Cordon Blue. What can you lose. Our waiter, surprisingly, announces that he is normally the violinist! On Friday and Saturday nights – reservations required – they offer a special 3 course meal for $25 – and there’s live Hungarian Music. We immediately start thinking of people we can invite who would just love that. This night – being a Wednesday – was music-less – but we were ok with that. We quickly ordered one each of the 3 main entries, told our hosts that we were a bit pressed for time – and were asked if we’d brought our own wine. Oh – it’s a BYOB. Make a note for next time! Reassuring noises immediately started coming from the tiny kitchen – and it’s clear our meal is being prepared to order. Now that’s great news – both Chicken Cordon Blue and Schnitzel are tons better made fresh. The meal arrives, it looks great – and the portions are prefect. 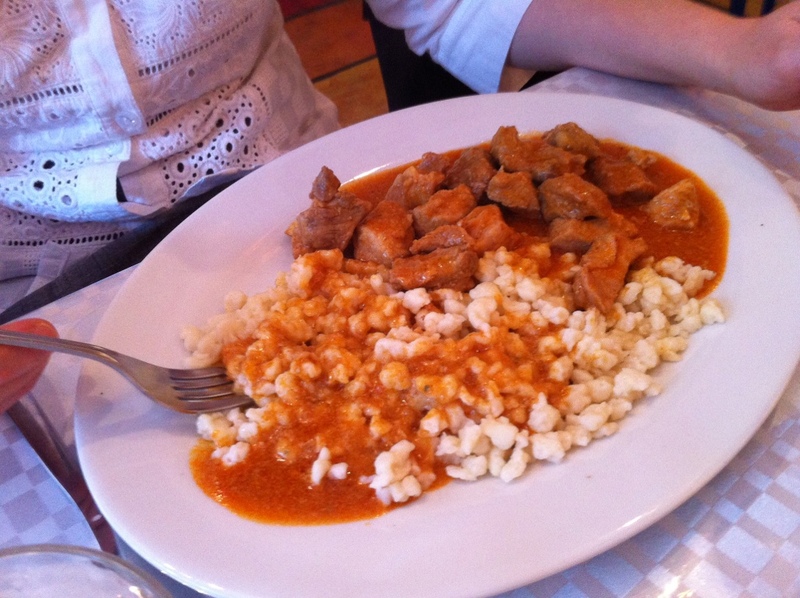 The Goulash is served with fresh spaetzle, pasta made by dropping the dough into boiling water. It’s fabulous – and the Goulash was clearly made long long ahead – exactly as Hungarian Goulash should be. 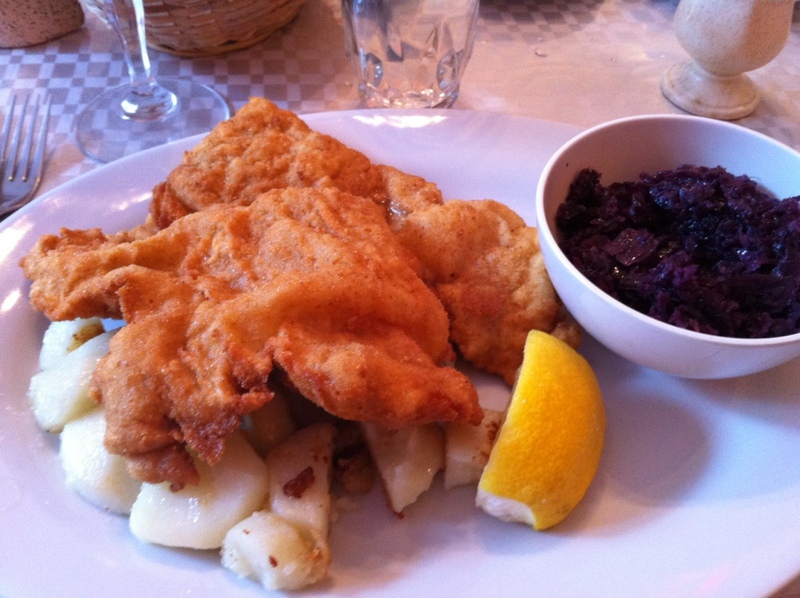 My Schnitzel portion is huge – and served with roasted potatoes (simple and so good), and a bowl of purple cabbage that was absolutely delicious. The third entre – Chicken Cordon Blue, a chicken Schnitzel stuffed with ham and cheese, also comes with the potatoes and the cabbage. Oh my, are we loving dinner. For dessert we order one Palachinta – a thin crepe folded over apricot jam and then served with hot chocolate sauce. Enough said. The waiter is amazed that we only want one for the 3 of us – but dinner was so filling! And we still need to stay awake for the theatre. To say we rolled out happy is an understatement. I’m definitely coming back to the Budapest! ← Where you sit makes all the difference! I discovered Budapest as well and I agree 100% with your take on it! I somehow wish it would remain one of those… best kept secrets! Wonderful review!